Lancashire Music Hub partners More Music recognises the importance of working with young women. Running projects like ‘Girls Allowed’ (pre dating Girls Aloud the band) and initiatives like ‘Girlschool’ – a regular girls only rock school workshop – have all had the overarching aim of ensuring young women have equal access to a wide range of music making activities. Especially those stereotypically dominated by men. As a result of this the ratio of male to female participants at their band and urban music making sessions are pretty much a 50/50 split. There’s a culture at More Music where it’s the norm for girls to be playing drums, guitar, writing songs, for boys to sing in choirs and for women to be running the studio or sound desk. Alongside this, More Music have developed the ‘Women in Music Network’ which has reinforced this approach on an organisational level, enabling the network to meet, support and employ women, especially in areas of under representation. This provides positive role models for the young people who attend their sessions and projects as well as providing career development opportunities for those working within the community music sector in the North West. The concept of ‘Girls Can …’ first arose when Music Leader Rachel Parsons met Charlotte Barber, Songwriter, Producer, Music Leader, DJ and presenter, through one of the first ‘Women in Music Network’ meetings. Rachel is a drummer who has played in bands for over half her life has always had an interest in women in music and specifically the under representation of women within the music industry. When she was younger, she unconsciously sought out bands that featured girls or, as a mother, she made a very conscious decision to seek advice from women who balance parenthood with a career in the industry. Though Rachel never felt she couldn’t or shouldn’t be playing a certain instrument, there has been, and continues to be, pre-judgments and barriers for women in areas of the industry usually occupied by men. On reflection, Rachel realised that that she hadn’t encountered a female sound engineer whilst touring the toilet circuit of venues in the UK. She never worked with a women in the studio. Not to say they aren’t any women working as sound engineers or producers, but recent statistics show us that only 2% of producers are known to be working within the music industry are women. Hence, ‘Girls Can …’ was created to, on a local level, redress the balance of women’s representation in the music industry, celebrate young women’s achievements and provide opportunities to explore areas of music and technology where barriers often exist for girls. 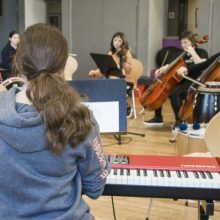 The three-day residency took place at More Music during February half term 2019 and saw nine young women come together from varied backgrounds. They brought a wide range of musical experiences and tastes and explored everything from composition to production, sound engineering to stage management in a safe and supportive environment. The group consisted of two cellists, lighting and sound engineer, a guitarist, drummer and bassist, a pianist and two vocalists all with varied musical interests and levels of experience. Many of them didn’t know each other at the start of the project, but all were eager to gain experience, learn more about songwriting and composition and make a change! Led by a team of inspirational women, all of whom work professionally within the music industry as musicians, sound techs, producers, composers, instrumentalists, educators and DJs, the week started with some ice breakers. This helped the group feel more comfortable and get to know each other before exploring rhythm and group improvisation through stick work and to bond through group singing. The group also started to explore music production using Logic Pro. They worked in pairs to create their own tracks using new skills they had developed. Some of the group had produced music before at college or school but to others it was a completely new experience, however working together to support each other produced fantastic results. Next came the ambitious process of live composition with a goal of writing a brand new piece of music to perform on the Saturday evening as the opening support for More Music’s gig – Annie Whitehead and Rude: 2.0. The challenge was to create a piece of music together that met everyone’s expectations. By the end of the first day, the group had a rough sketch of a song with lots of individual riff ideas and melody lines ready for day two. Day two started with a recap of the ideas developed during day one and listening back to the recording and shared arrangement ideas. Then after a quick warm up and primal scream, the group got back to work, arranging their ideas into an agreed structure while the vocalists developed lyric themes into a melody for the song. The pressure was on as a jazz trombonist Annie Whitehead was joining the group for a coaching session in the afternoon, so they needed to have the basis of a song rehearsed up ready for her to listen to. The group worked hard on the basic structure of their new song and were ready to perform it to Annie as she began the process of breaking the song down to work on the finer details of parts, arrangement and performance. Annie spent an intensive afternoon exploring individual parts and the way they fit together collectively which was a new experience for the group. Through this they developed new skills in instrumental and ensemble arrangement. They also spent time exploring the finer details of songwriting and chord progressions in order to take their performance to the next level in terms of musicality. Annie worked with band on performance techniques, confidence and the delivery of a song as well as thinking about purpose and conveying their message. Day two ended with a final run through and recording of the track. Day three started by listening through and sharing and thoughts about the song, plus the creation of a title for the song which, it was agreed, should be ‘Proud’. The band spent the afternoon rehearsing the song on stage in preparation for the evening gig opening for Annie’s band Rude 2.0. Following the previous day’s masterclass they had clearly grown in confidence. The track was sounding great! The group members interested in developing their technical skills and experience with sound and lights set up microphones, lights and programmed the lighting desk and formed the tech team for the show. They worked on microphone placement, monitor mixes and lighting design as well as recording the rehearsals ready for the evening. As the audience arrived, the ‘Girl’s Can …’ band gathered excitedly in the Green Room, tuning up and sharing nerves and performance tips. Finally it was time for the first ever performance of ‘Proud’ in front of a full house.